Donald Trump is known for having never used a computer. Yes, he infamously writes his own tweets on his phone (and dictates them to lackeys before 7pm) but we have precious little evidence that he has actually sat down and used a desktop or laptop computer. Until now. Kellyanne Conway, the advisor who talks to Trump through the television box, just gave us the best evidence to date that perhaps Donald Trump has moved the cursor on a laptop. 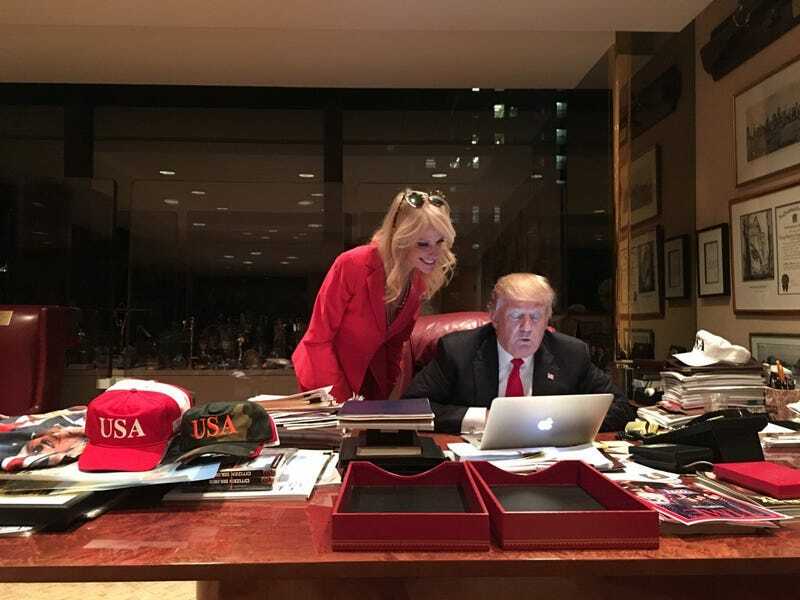 Conway tweeted out the photo above, showing President-elect Trump looking at the screen of a MacBook. It’s like seeing a rare animal in the wild—a rare animal trying to figure out what all those buttons do. Yes, we do have a photo of Trump from July looking perplexed in front of another Apple product. (Remember when Trump said he was going to boycott Apple products by the way?) But this time his hand is close enough that he could plausibly be “using” it. I’m not sure that the photo below would stand up in court as “use” of a computing machine, but it’s the best we’ve got for now. What do you think? Does the photo that Conway just sent out convince you our Dear Leader has gained some computer knowledge? If he is really using a computer, what do you suppose he’s looking at? All we know for sure is that it’s not the nuclear codes. He doesn’t get those until January 20th.